This shed may be small, but we were surprised at just how much we could fit into it thanks to the relative height of the eaves and the door. This makes it an ideal choice as a storage facility in gardens where space is at a premium. Because it has a reversible roof and door, it’s also suitable for gardens of unique size or shape, making it even more versatile. Lean to sheds often have excellent weather protection, aided naturally by the cover of the wall against which it’s leaning. Weather protection in this case is also enhanced by the high quality galvanisation used on the base steel, as well as by three coats of paint that are applied inside and out. When all these factors are added together, we can understand how the manufacturer is able to supply such a long warranty against perforations appearing because of rust. The window free design has purposely been chosen to increase the shed’s security, by keeping prying eyes away from the contents within it. If preferred, however, the owner can have a skylight or window added as an optional extra. This is just one of a range of options available, although one of them, a set of Hilti screws to attach the shed to a concrete base, we would have liked to see included as standard. 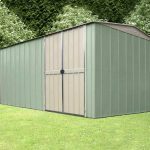 We love lean to sheds because their sheer versatility makes them suitable for almost any garden. This came to mind particularly when we reviewed this shed, both the pitch of the roof and the alignment of the door can be reversed, allowing the owner to create the ideal shed for their particular garden. The pitch of the roof on this shed, is just enough to ensure that rain and snow is carried away while not being too obtrusive. 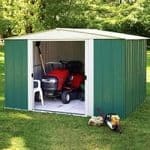 Although it also adds a few extra inches this isn’t really needed, as the shed is already taller than most that have a similarly compact footprint. The ridge height is 2.03m and the eaves height is 1.78m. 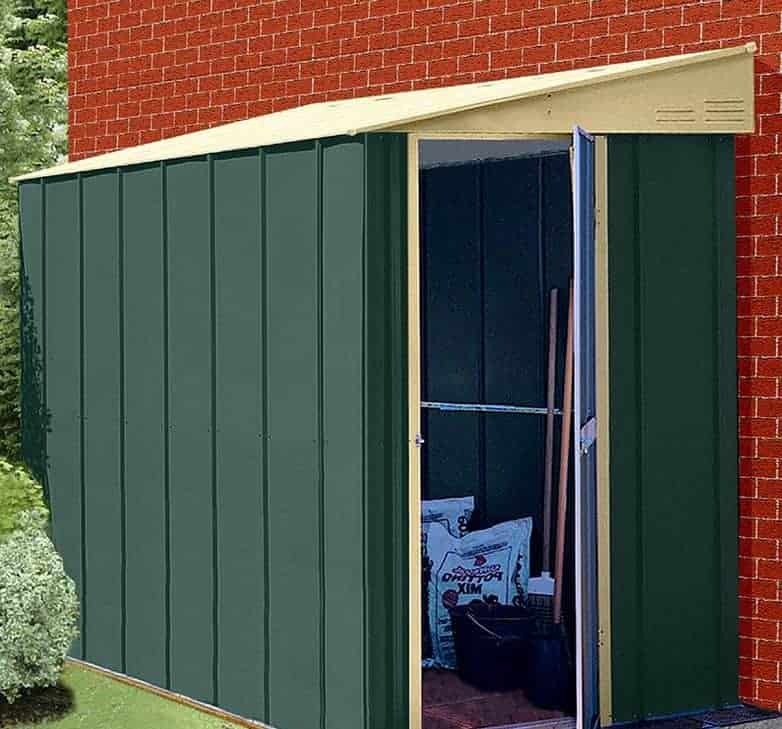 When finding the best place to site the shed you’ll need to keep in mind the outer dimensions, which are a width of 1.41m and a depth of 1.71m. We were impressed by the effect that the hot dipped galvanisation, added to a robust galvanised frame, made to the cladding and the stability of the shed as a whole. In effect there are three layers: the steel itself, the zinc plating, and finally the metallic paint on the surface. This is a very effective combination when it comes to keeping water out, and creating a strong yet at the same time light shed. A flat area of concrete is needed to install the shed upon, although a level and stable area of patio or paving could also be utilised. Once this area has been found however, you’ll need an anchor kit to affix it. 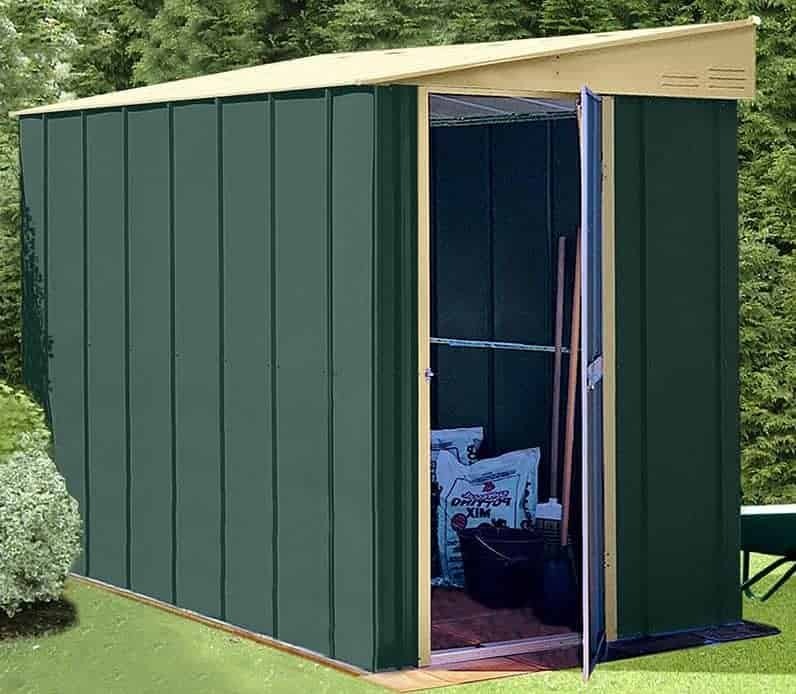 Unlike some other manufacturers, Shed Baron don’t include such a kit as standard so you’ll need to purchase it, or alternatively one of their flooring kits, at the time you buy the shed. 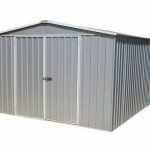 When reviewing metal sheds we expect to see a warranty of at least 10 years because of the nature of metal, being rot free and protected from attack by rodents. We were very pleased to see that on this occasion, the owner receives a warranty that’s twice as long as many other sheds, with Shed Baron giving a 20 year guarantee that there won’t be perforations caused by rust. With no annual treatment needed by the owner this really can save time and money, as well as providing peace of mind. We liked the single hinged door on this shed, because it was obviously well braced and felt strong and durable. 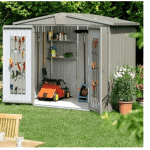 Its width of 0.65m is standard for metal sheds of this size, and is almost as wide as some double doors that we’ve seen, and the door height is 1.73m. We found this as welcome as it is accommodating, as not having to stoop to get through a door makes a big difference, particularly if carrying heavy or bulky objects. Whilst there are no windows on this shed, ventilation is provided by means of panels in the gable. There is also the option to add either a skylight or window, for those who prefer natural light in a shed. 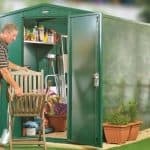 With a shed, privacy often leads to security, as thieves who can’t see what’s inside a shed are more likely to look elsewhere. That’s why we welcome the absence of windows as a security enhancing feature. Security would also be improved by the addition of a strong padlock, and again just the sight of one can act as a deterrent. The handles are holed and ready to accept one, but the padlock will need to be purchased separately. If you’re looking for a simple and time saving installation then we recommend the purchase of a set of Hilti screws and attaching the shed to an existing area of level concrete. Alternatively, however, there are two flooring kits available. These are designed for people who either need to construct a suitable concrete base or who want to add a timber floor to their shed, and both will add considerably to the overall price paid. Other options to consider, as well as shelving units, are a skylight or sliding window. Both of these feature styrene glazing which has a clear finish but is tough and shatter resistant, giving greater security. We were very impressed with the overall quality of this shed, and all the components were well machined and ready to use. 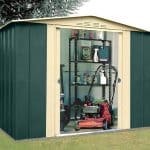 20 years is a long time to have a shed in our climate without having to worry about damaging rust, but that’s the minimum you can expect from this shed as the warranty period shows. This is designed for people wanting the convenience of a small shed, and yet thanks to its height we were pleasantly surprised at how much could be fitted inside. This can be further enhanced by the installation of optional shelves. We would have expected a small shed to take less than the four hours it took us to complete the installation, but there are quite a lot of parts that look similar. Be sure to read the instructions thoroughly before beginning the assembly. Although adding a flooring kit, window, or skylight will add to the initial purchase price, the standard cost represents good value for a sturdy and reliable lean to shed. 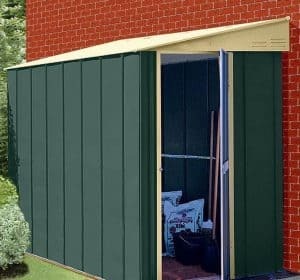 Final Thoughts: The side of a house is often an ideal place to position a shed, because of the increase protection it offers from wind and rain, and this is one of the best compact lean to sheds that we’ve seen. It’s deceptively spacious inside, belying the small footprint which means it can fit almost anywhere. The roof can also be reversed to help it fit in with the unique features of your property. Although it took a little assembling, we were very pleased at how strong it appeared to be once up, and the pitched roof and galvanised walls will help keep the contents of your shed safe and dry.